It Puts the Lotion on the Skin or Possible Parenting Fail. For a few years now (well, specifically since January 2010), I've been quoting a particular scene from a particular horror movie during a particular time in the post bath pre-story time portion of my sons evening. I realized today this could come back to haunt him in a two possible ways. Two... a perfect flashback during retro movie night when he is in College surrounded by his friends and peers. It's the year 2030 and someone in his dorm bought a VHS player from a yard sale. Naturally, this is a perfect reason for a party. Retro movie night posters go up. Of course, they have to also buy an old TV because certainly no sets have coax inputs. They search around the library and call on grandparents looking for something to watch in this antique machine. Someone finds an 8 track cassette tape and shoves it in almost breaking it. They find a copy of Silence of the Lambs still in the box. "It's cool to see a picture of the movie before you watch it." "The tracking lines are so charming." "How could people watch movies like this?" They get to the Buffalo Bill scene in which he says, "It rubs the lotion on its skin." And my son goes silent. Like a lamb. "Skip back to that part." He says. "I don't think you can skip back with VHS." His girlfriend says. "I think it's called rewind." A friend says. "Like those red t-shirts that say Be Kind - Rewind." "I hate those shirts." His girlfriend says watching my son turn a little ashen. "I recognize that line from somewhere? We need to play it again." When they figure out how to rewind... he figures out where he heard it. "My dad used to say that to me when he lotioned me up before bed when I was three." "Your dad is a twisted man." Says his girlfriend. 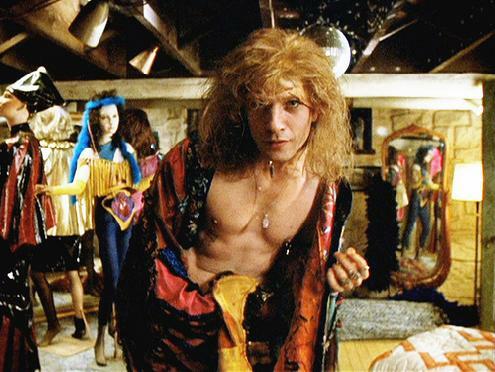 And then when Buffalo Bill starts dancing around the room in a lady's robe my son says, "Yep, seen this before too."